After the latest crash I managed to recover the base and redid the painting. Like I said sometimes redoing things work out better. I now have more control over the appearance in a non-destructive way. Since the uv’s were done I was able to start some texture work. (Sorry for the missing Eyeballs, 😉 ). I’ve replaced the eyebrow mesh with just a textured one. This will make it way easier when I create facial shapes for expressions, besides it is much more in style with the original drawing. For texture work I prefer to work in Substance Painter because it is really powerful and straightforward. It also gives me a lot of freedom because of baking some texture information. Playing around in c4d r19. With Maxon’s release of Cinema4Dr19 we have Physically-Based Rendering in the viewport as well. It is a real time rendering method which provides you with instant feedback over what your light is doing as well as your Cameralens (Depth of Field). This will be such a timesaver and looks awesome. PS: A real lesson again. Went out for groceries and the whole Substance Painter crashed on me again. CTRL-S is your best friend! Always SAFE SAFE SAFE! Not all is lost, the base is still there. Well the repetition is a welcome practice I guess. WARNING! Technical nerdstuff in this post. One of the things that is really tedious in 3d is the creation of a proper uv map. 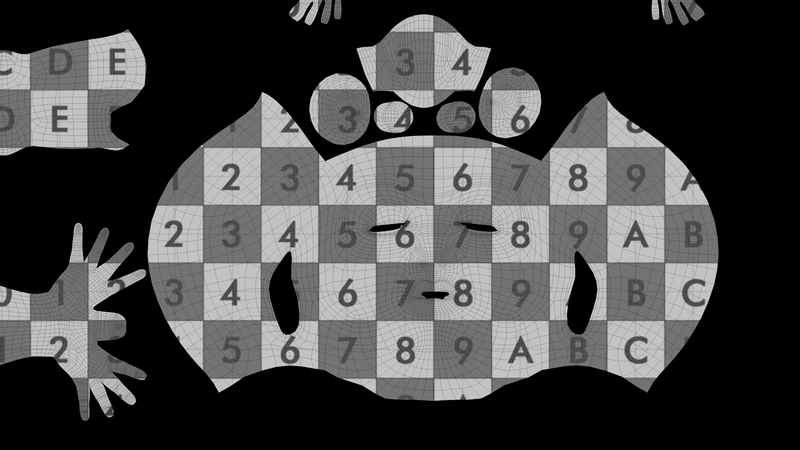 The best way to describe a uv map would be “If you kill a deer for instance for the pelt you skin the animal.” So you unfold the hide so to speak. The same applies for the 3d model in this case. It is like an unfolded version of the model. This is needed to give the 3d application an atlas of what goes where. When deforming the character with joints the shaders and details will follow properly. The numbers and letters are there for a reason. It is to be able to check if al the UV islands are pointing outwards. If not you would spot it instantly because the text will be mirrored. You can also see if there is a lot of stretching or deformation going on. I usually use c4d to unwrap, don’t ask me why, the UV tools date back to the middle ages. After the unwrapping I import the model in to Zbrush and use the UVmaster tools to properly smooth the UV’s. 9 out of 10 it will give you something decent to work with. For mechanical models I usually stay in c4d or maya. It may seem like small or no progress but after this stage the fun with texture painting can begin. Toes, oh yes. And some small tweaks on the arms to get more anatomy in there. Well, I’ve got the hair sort of blocked in. I tried to use the c4d hair first but I am not even gonna show you those experiments. I became to much of a doll so I wanted to stay with the abstract approach, not that this is a much easier way to do it but it is more consistent in style. it is build up in parts but I think I am going to use Zbrush to dynamesh it all together to get one solid model. To be continued. Missing toes and need to look at some more volumes and lines but I am almost there. Done with the base for the hands. 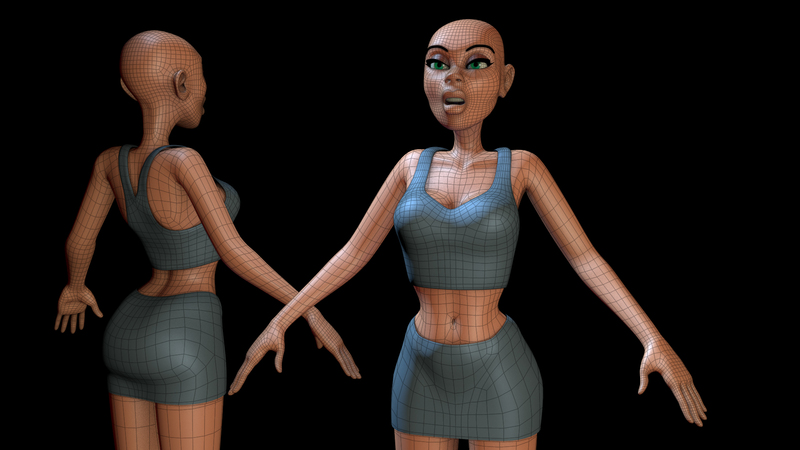 I also tweaked some parts of the mesh in her face and moved the shoulders down a bit and made her neck a little longer. Next up the legs and then on to detailing before creating the UV’s for the texture process. I had some time to work on the body. It’s still all poly-modeling and trying to keep a focus on the lines and edge loops. There are still bits I need to clean up but overal it is pretty clean already. Still no expressions and a basic T-pose (more like a M-pose, but I just find it works better when deforming it with joints). Shading still basic to just get an idea. The ear is also finished and I think is is detailed enough.